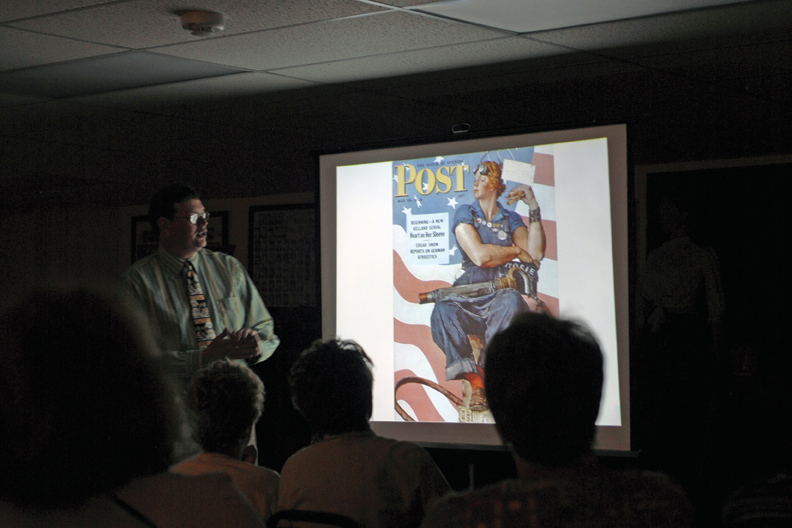 Tom Daly, left, Norman Rockwell Museum curator of education, discusses an illustration Norman Rockwell painted for The Saturday Evening Post during a presentation Saturday morning at the Museum of Northwest Colorado. Daly pointed out similarities between the illustration and Michelangelo’s painting of the prophet Isaiah in the Sistine Chapel to illustrate how Rockwell took inspiration from great artists of the past. A man puts his arm protectively around a woman’s waist as she fills out a form in an office. In this illustration Norman Rockwell painted for The Saturday Evening Post, the woman stands on her tiptoes to reach the desk where she writes. A sign behind them reads “marriage licenses,” explaining the reason for their visit. What the casual viewer may not know is the young man and woman who posed for the painting were actually engaged to be married, Tom Daly, Norman Rockwell Museum curator of education, told a group of about 25 people Saturday morning. The date on the calendar next to them reads Saturday, June 11 — the day in 1955 this picture would appear on The Saturday Evening Post’s front page, he said. The detail was an “inside joke,” one of many the illustrator worked into his paintings, Daly said. He revealed details about the illustrator’s life and work during the first of two presentations at the Museum of Northwest Colorado. The events were designed to coincide with the museum’s temporary exhibit of all 323 Saturday Evening Post covers Rockwell illustrated. Another little-known fact: The artist was once commissioned to paint illustrations for a book, Daly said. Rockwell made frequent appearances in his own work. About 90 of Rockwell’s 4,000 or so surviving paintings feature the artist himself, often sporting a bow tie and pipe, Daly said. Some of Rockwell’s paintings also included his family members including his second wife Mary Barstow and their sons, Jarvis, Peter and Thomas. Although often known for painting scenes from everyday America, Rockwell studied notable artists including Michelangelo and Vincent van Gogh. “He was inspired by the greats of the past,” Daly said. Rockwell created paintings that gave viewers a kind of “road map” to guide their eyes through the illustration, picking up clues along the way. “His hope is the detail will tell you the story,” Daly said. The stories Rockwell tells in his paintings take root in universal themes and experiences viewers can identify with. Craig resident Karen Chaney came away impressed with the presentation Saturday morning. “I think it was excellent,” the 54-year-old said. As a Moffat County High School history teacher, she can appreciate how Rockwell’s work documents major changes in America. If you’re willing to study his cover illustrations for The Saturday Evening Post, “you can learn a lot about American history,” she said. Dan Davidson, Museum of Northwest Colorado director, said he was unsure how many people would come to the presentations, given that Whittle the Wood Rendezvous and the Bear River Young Life and Colorado Cruisers car and motorcycle show were scheduled at the same time. But even with the concurrent events and a venue change from The Center of Craig, the event drew a wide range of attendees. “We’re happy with the turnout and the interest in the people that came,” Davidson said.